Introducing the cookie dough that has it all—good looks, superb flavor and texture, and the flexibility to become your holiday baking BFF. Roll it out and cut it, press it into shapes, or create your own incarnations. However you slice it, this sweet brown-buttery sensation by The San Francisco Ritz-Carlton pastry chef Cindy Falatic McIntosh is a sure thing. This recipe makes a small mountain of delicious, perfectly textured cookies with flavor hints of brown butter. But you can halve it or store unused cookie dough, wrapped in parchment paper then aluminum foil in a ziplock plastic bag, in the freezer for 3 months and pull it out anytime you want instant homemade-cookie gratification. We recommend using a light-colored saucepan when browning the butter because it’s easier to see how dark the butter is getting. Place 1/3 cup of the butter on a plate to soften. Cube the remaining 1 cup butter into 16 even pieces and transfer them to a light-colored saucepan over medium heat. Stir the butter with a rubber spatula, scraping the bottom of the pan as it melts. Once it starts foaming, stir until the foam subsides and the butter begins to turn light brown. Continue to cook until it starts to smell nutty and takes on a slightly darker color, 1 to 2 minutes. Watch to ensure the butter doesn’t get too dark. Remove the pan from the heat and immediately pour the butter into a heatproof container. Cool in the refrigerator, covered with plastic wrap, until solid. In a bowl, sift together the flours, xanthan gum, salt, baking powder, baking soda, and cinnamon. Reserve. In the bowl of a stand mixer fitted with a paddle attachment or by hand, cream both of the reserved butters and the sugar until smooth. Mix in the eggs, scraping down the sides of the bowl, then mix in the cream cheese. Mix in the vanilla and lemon zest and scrape down the bowl again. Add the sifted ingredients and mix to combine. Scrape the batter into a bowl, cover with plastic wrap, and refrigerate for 90 minutes or until the dough is firm enough to handle. Preheat the oven to 325ºF. Line baking sheets with parchment paper. Place the dough between 2 pieces of parchment paper and roll 1/4 inch thick. 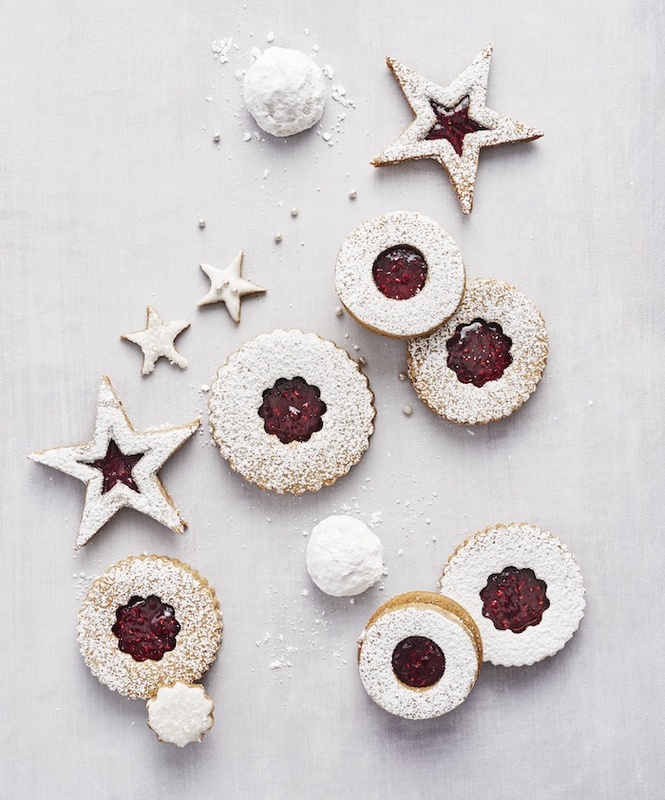 Cut cookies using a cookie cutter dipped in a neutral GF flour before each cut. Bake until the cookies are just start to color on top and are golden brown underneath, 12 to 15 minutes. Cool completely and decorate with royal icing.